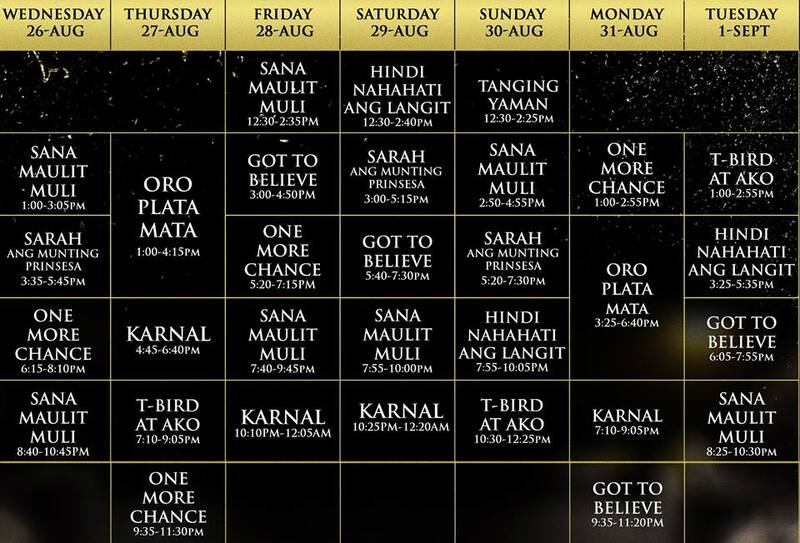 MANILA - Some of ABS-CBN's digitally restored films will be shown at the Power Plant Mall in Rockwell, Makati from August 26 to September 1. 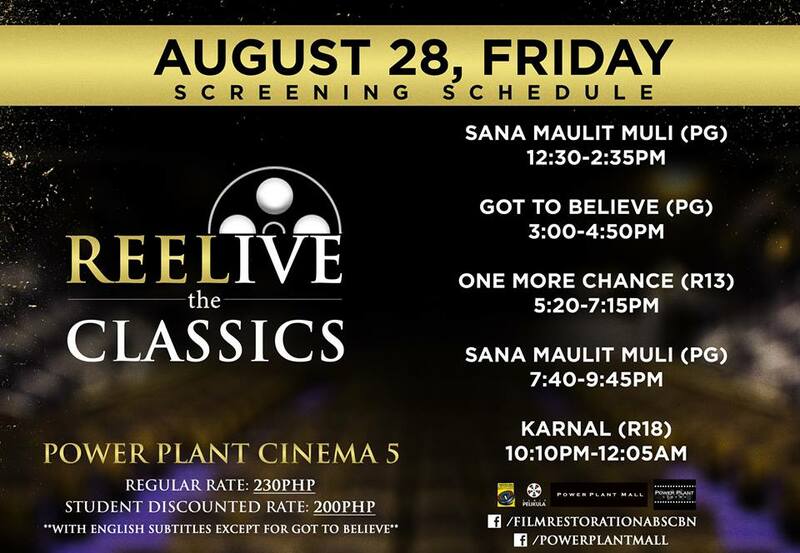 The film exhibition, dubbed "REELive the Classics", is a result of a partnership between ABS-CBN and Rockwell. It will feature movies such as "Sarah ang Munting Princesa", "Got to Believe", "Sana Maulit Muli", "One More Chance", "Oro Plata Mata", "T-Bird at Ako", "Karnal" "Hindi Nahahati ang Langit" and "Tanging Yaman". ABS-CBN has been restoring classic films since 2011 as part of an effort to preserve Philippine cinematic history. With the help of Central Digital Lab, the ABS-CBN Film Restoration Project has brought to life over 100 movies, some of which were screened locally and internationally. 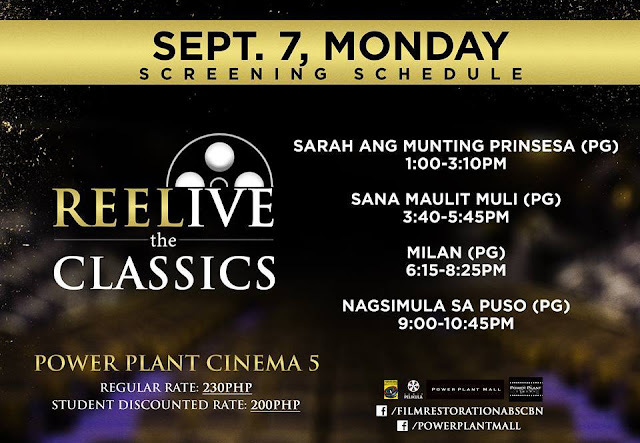 #REELiveTheClassics schedule for Aug 27 at Power Plant Mall Cinema 5. 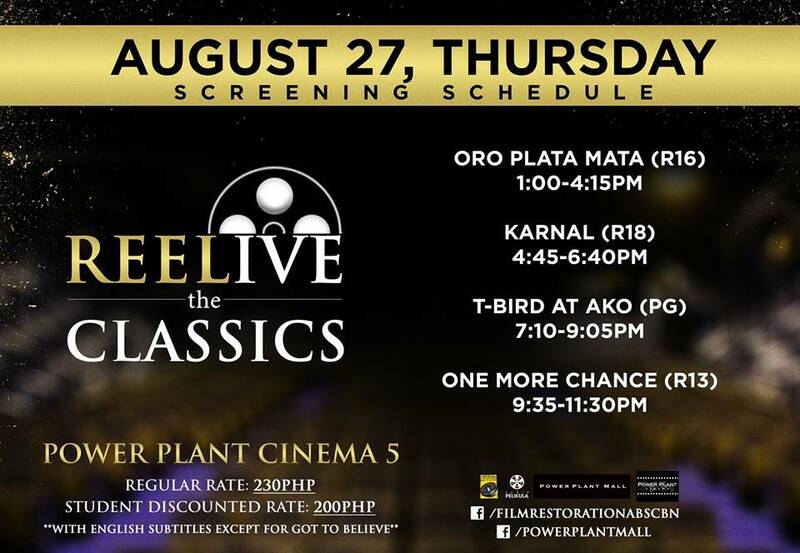 ‪#‎REELiveTheClassics‬ schedule for Aug 28 at Power Plant Mall Cinema 5. Update as of Monday, August 24: For online purchases for the Rockwell REELIVE Screenings, the link is: powerplantmall.com and you can already buy tickets for Wednesday. For the rest of the screenings purchases are available the day before. And there is also walk ins at the box-office.